Approx. 20 x 26 in. Roland Hayes was the first black male to win acclaim in America and Europe as a concert artist. A native of Georgia and the son of ex-slaves, his family moved to Tennessee when he was thirteen. He obtained his basic music training in Chattanooga with Arthur Calhoun and at Fisk University in Nashville. Later he studied with Arthur Hubbard in Boston and with George Henschel and Amanda Ira Aldridge in London, England. 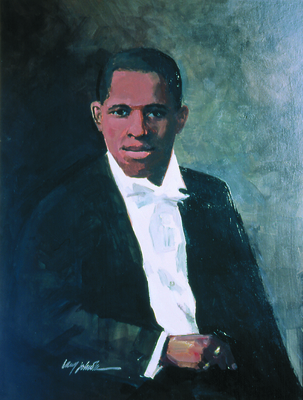 Hayes began singing in public even during his student days and in 1911 toured with the Fisk Jubilee Singers. Seizing every opportunity to sing before the public, Hayes arranged his own recitals, including several coast to coast tours during the years 1916-19. He became well known in the black communities of the nation and was “imported” to sing at all the important musical events. Although Roland Hayes was unable to get a professional manager early in his career, that did not stop him on his quest to sing. He invested in himself and raised the money to finance his own concerts at Jordan Hall and Symphony Hall in Boston. Hayes was a talented success but financially did not do too well. Like many American artists before him, Roland Hayes headed for Europe. There he hoped to continue to be a student of vocal art as well as work at his profession. Slowly but surely, he became known in many circles. He gave a number of recitals, one of which was at the Royal Chapel. His recitals of spirituals were well received. He was also invited to sing at Wigmore Hall. Suffering from pneumonia, Roland gave a moving performance, and the British newspapers acclaimed him as a musician of the first class. Mr. Hayes was invited to sing before the King and Queen of England. Roland Hayes returned to America. He was now able to get the professional management and promotion that had been denied him. Boston Symphony’s manager, William Brennan, signed him up for 30 concerts. Hayes performed throughout the western world during his long career. He enjoyed an international reputation during the 1920s-40s as a concert tenor. He encouraged the development of young talent and served as mentor to several young artists, giving freely of his talent and time as well as financial aid. In 1924, Hayes was awarded the Spingran Medal by the NAACP. He taught at Ohio State University and received numerous awards for outstanding contributions in music and the betterment of his people and all people. Roland Hayes died in 1977, but his contributions will be with us until time indefinite. Roland Hayes. (1995). 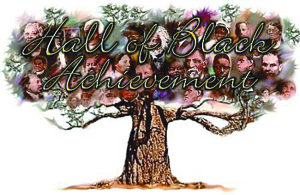 In Massachusetts Hall of Black Achievement. Item 24.